It's time for a new challenge @ 613 Avenue Create & this week our optional twist is to use an Irish Blessing/Saying/Quote on your creations. 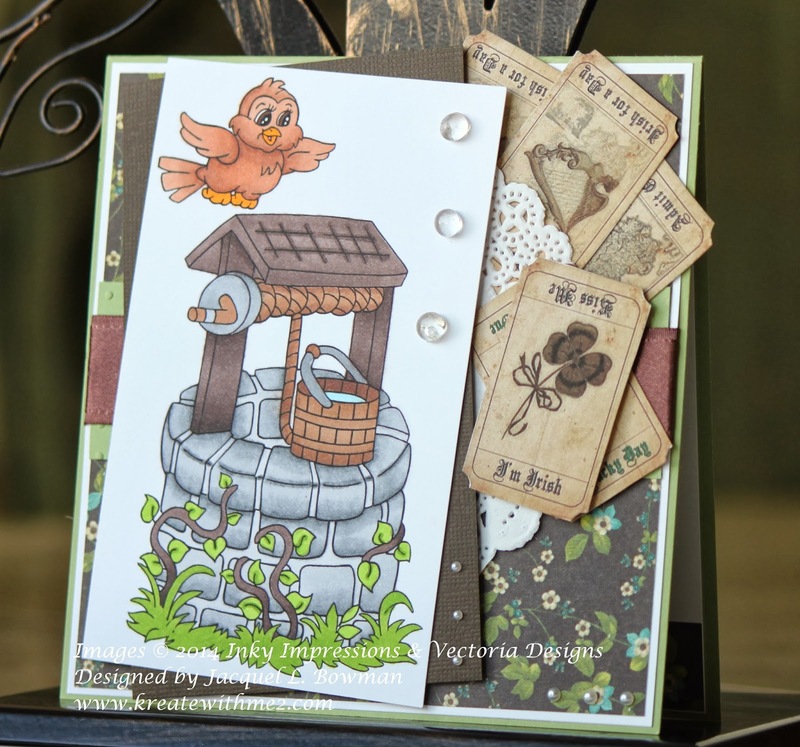 We have a few different sponsors this time around & I used the wishing well image from Inky Impressions & St. Patrick's Day vintage tickets from Vectoria Designs to make my card. That image was fun to color...particularly the stones!! My teammates made pretty cards too so hop on over to our blog for some more inspiration & while you're there; read up on our rules so you can play along with us! I'm looking forward to see what you all come up with....have fun & happy stamping everyone!!!! Jellypark Friday Challenge ~ Things with Wings! Ladybug Crafts ~ Spring is Here!! Jackie - I really like the imaginative way you used the Vectoria tickets! Nice design toots! So nice Jackie! The little bird is so cute!!! Love the card and your coloring! What a lowest little bird image! Great design & coloring. Thanks for playing DRS Designs this week! This card is GORGEOUS!! The layout is to die for!!!! Fabulous image, Jackie. Love all the layers and those fantastic tickets. Such a sweet image and beautiful coloring, and a great layout with all those tickets! Thanks for playing at CFAS this time! very cute card, it's so nice to see spring images and I love your ticket embellishments. thanks for playing with us at Jellypark Friends. Adorable image! Such a wonderful card with so many fab elements and of course, love the green, green, green! So glad you joined us for our Green challenge at Digi Haven! So cute! I love this adorable image and the great design. Thank you so much for entering it into our challenge at Crafty Ribbons hun and Good Luck! Lovely image, and perfect timing for St Patrick's Day. Thank you for joining us at the Crafts Galore Encore Use a Stamp Or Digi Somewhere On Your Project Challenge #3 and Good Luck!